What is Glamping and Why Should You Try it? Glamourous or luxury camping, also known as “Glamping”, is a fantastic way to get back to the great outdoors and experience the beauty and freedoms of camping without depriving yourself of the comforts of home. Gone are the messy days of building fires and putting up tents. Glamping allows you to snuggle down into a comfortable, warm bed after a hot shower. All the necessary kitchen accessories needed to create a yummy home, cooked meal are available to you and depending on where you are staying, you may be provided fully prepped, delicious meals right to your camp. Leave the hustle and bustle of the big city behind you, and escape to your very own secluded corner of the world. Climb a mountain, go on an adventure in the forest, take a dip in the open sea or explore a hidden cave, dare to be free without the limitations and discomfort of traditional camping. Your imagination is your only limitation when it comes to the great outdoors. There are endless chances to enjoy your amazing surroundings. Flat over the glassy surface of a lake or river in a kayak, hit up some mountain bike trails, spend an afternoon seeking out local wildlife. The possibilities are endless. If you are looking to experience a camping adventure but are not so into the thought of having to pitch a tent, sleep on the ground or shiver in your sleeping bag, glamping will give you the chance to snuggle right into a cozy bed at the end of the day. Not only that, but you will be able to have a hot shower too! There really is no better way to reconnect with nature than to spend a few days living within it. Glamping is an almost perfect way to experience all the amazing benefits of the great outdoors. Relish in the beautiful scenery, gain a new appreciation for the plants and animals that make up the forest, and breathe in the fresh air. Getting outside has many amazing health benefits that will have you returning home feeling rejuvenated and happy. Next time you decide to book a travel experience, look at some of the fantastic glamping experiences that can be had all over the world. Now is certainly the time to get back to nature and you don’t have to be uncomfortable to do it. I would love to go Glamping. It looks so luxurious and a great way to relax and enjoy the great outdoors.I think it would be awesome good fun! This would be perfect since I have had many rainy wet tenting experiences and will probably never tent again. I love the idea of Glamping. It would be great to enjoy the great outdoors with all the comforts of home. I don’t quite get the appeal because I always went camping when I was young and although I had a trailer that’s where the luxury ended and I always had the best time. Never heard of doing this really, it sounds like it’d work. I haven’t been camping in so long. The idea of glamping is much more appealing now that I am older (just can’t fathom sleeping on the cold, hard ground any more). I love this idea of glamping. First time hearing about it but sounds like fun. I think of all the types of camping glamping would be my favorite as the idea of putting a tent up and taking it down is intimidating. I’ve heard of glamping but haven’t done it. Sounds really interesting though! Looks and sounds interesting. Never heard of it before Certainly beats sleeping on the ground with a damp sleeping bag. I’d love to go glamping. have never taken the opportunity. thanks for the post explaining it. Ok That kind of camping I could do. I am not normally a princes. I use power tools and dig holes but sleeping on the ground and cooking over a fire NO way. I love to camp, but definitely can’t sleep on the ground any longer because of arthritis. This would be the perfect solution for me! I’ve always wanted to go glamping, I just haven’t had the opportunity yet. Comfort and nature together sounds great! I couldn’t imagine camping in a tent with my 1 and 5 year old. Glamping is the way to go! We invested in a camper 3 years ago and it’s one of our best purchases. Why not enjoy a more comfortable way to go camping. We always “roughed it” when we camped as kids. Now, however this glamping is way more appealing. Wow I sure would love to go Clamping instead of camping where one wakes up with sore joints and quite often cold. Clamping sounds so much better and would be great waking up to a cooked meal instead of getting a fire going and waiting for water to boil so I can have camp coffee. I love nature and being outdoors enjoying the water and short hikes. a long time , it’s just been upgraded by social media because good campers can now share more about how to be comfortable while you spend your time outdoors. I honestly love regular old fashioned camping but if I had the magical to try this shiny glamping comfort station .. just give me time to call my BFFs ,pack the wine and nice in a real bed pjs!! Oh ya I could get used to this! 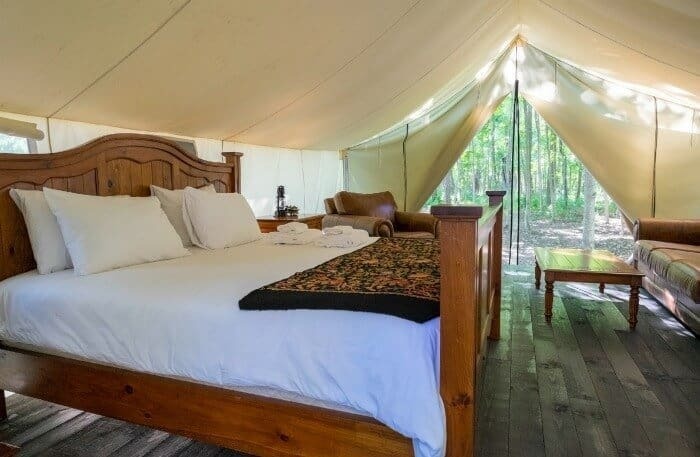 Glamping sounds appealing now at my age for the comfort but I really do still love the tent with sleeping bags on the ground camping experience. love camping in our surrounding mountains and lakes/rivers, closer to nature! Definitely the way to camp if you can! I do it all the time, when I am not actually pack riding or going deep into the high country. Its the way to camp comfortably. I always sleep better outdoors, but my wife hates camping. Glamping might be a good compromise to get us out there together. OMG, I would love Glamming, now that I know what it is. Would be amazing. I am definitely not a camper but I could definitely be a glamper! I love this idea – except I hate bugs. I can’t get past the bugbites! I would love to glamping it is far bette rthan just going out in a tent! I love the idea of Glamping. I wish there were more places to do this. I love Glamping its like the comfort of your own home but with the opportunity to explore the outdoors. It seems to be more glam than ping! I could Totally Enjoy Glamping! Thank you for the information on it. Oh my gosh this looks wonderful. I only tried camping once and we had a lake storm. My husband kept on saying “You are such a good sport!” I haven’t tried it since but this looks like a little slice of heaven. Hhm. I will have to look into this. Thanks! Would love an opportunity to try this! I think it sounds amazing but some of the ones I’ve checked are more expensive than going to a hotel… I love nature and all, but I don’t have to worry about any bears or anything dragging off my family while I’m sleeping if I’m in a hotel. I’m a coward, lol. I have been camping in a tent all my life. This looks amazing and hope to try it if it isn’t too expensive. I’d love glamping, most of all because I cannot stand mosquitoes! I’d want a comfy bed surrounded by a romantic-looking mosquito net!